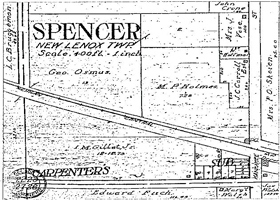 The Village of Spencer was platted in 1856, the earliest mapped community in New Lenox Township. A storage structure was built that same year and a grain elevator the following year. A line of the Michigan Central Railroad was immediately available to area farmers for shipment of agricultural products. A post office was established in 1857 and lasted until 1913. Store of M. P. & J.S. Holmes. Spencer Will Co Ill.
By 1878 several businesses were operating at Spencer: two general stores (one operated by the Knapp brothers and one by N. P. Holmes), a saloon, blacksmith, shoe shop and grain business. A frame one-room school house provided education for area pupils until the middle of the 20th Century. 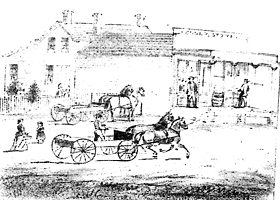 This apparently marked the high point of business in the area; gradually as transportation improved, business was diverted to the larger communities of Frankfort, Mokena and New Lenox. People have continued to reside and farm in the area, but Spencer as a community never experienced the growth of other communities or formally organized.